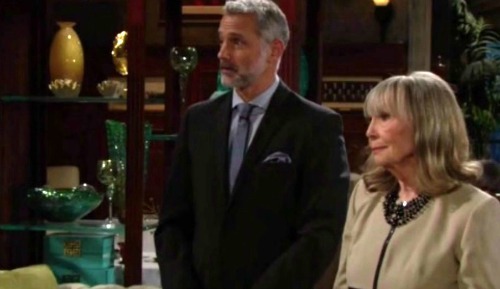 The Young and the Restless spoilers tease that Dina (Marla Adams) may not have been the only spouse to have had an affair while she was married to John (Jerry Douglas). Evidence appears to be mounting that could reveal Graham (Max Shippee) as his son. Ashley’s (Eileen Davidson) outrage would rival Jack’s (Peter Bergman) if this speculative point proves true. Their hero-worship of John and belittling of Dina would also be transformed as a result. Y&R viewers recently learned that Graham’s mother never died. She’s alive and has been living in Florida at a senior citizen facility, which has been paid for by Graham. Additional backstory information also revealed that Mrs. Bloodworth once lived in Genoa City, which indicates Graham may have as well. Guesstimating the seeming age of Graham’s mother, carrying the one to the tens column, adding the numbers, checking the math with a number 2 pencil and then looking at the results is stunning. Graham is within Ashley and Jack’s age range and could also be unaware of his own biology. However, if he does know that John is his father, then he is plotting to take Dina’s money and grab his share of the Jabot fortune. Savvy fans loved the recent flashback scenes where younger actors portrayed the Abbott family in the 1960’s. Those images may have been made for reasons that went beyond fleshing out Ashley and Jack’s memories. John could have been damaged by Dina’s affair with Brent Davis (Bert Kramer), which resulted in Ashley’s conception, and by his wife’s subsequent desertion to such an extent that something else happened. He could have gotten together with whoever Mrs. Bloodworth proves to be. Graham’s age and his mother’s now-confirmed link to Genoa City aren’t likely to be soapy red herrings. Those points have been written in for a reason. Because Shippee’s character has been holding a number of cards back, it’s obvious that his agenda goes far beyond wanting to help Dina. Whether he’s developed protective feelings for her or not, she seems to have likely been a purposely target. John may, or may not have known about Graham. If he did know, Mrs. Bloodworth could have been harboring feelings of resentment for decades and has conditioned Graham to feel entitled to his take of the Abbott money ball. If that’s the case, Dina would merely have been a gateway into John’s family. Viewers recall that Graham was an actor before he began stalking Mergeron Enterprises, with the intent of specifically working for Dina. His actions since arriving, or possibly returning to Genoa City, have only furthered suspicion that’s based on growing circumstantial evidence. CDL is a leading source for everything linked to The Young and the Restless. Check back regularly for Y&R spoilers and news! 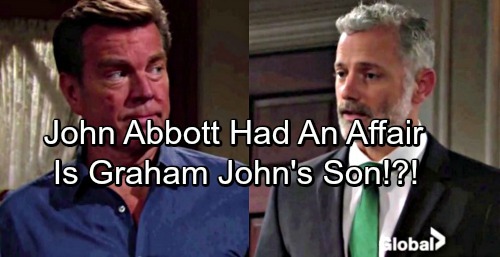 Graham Has A Hidden Agenda – Is He John Abbott’s Son? The Young and the Restless Spoilers: Friday, September 22 – Juliet Collapses In Intense Pain, Faces Miscarriage Baby Crisis?